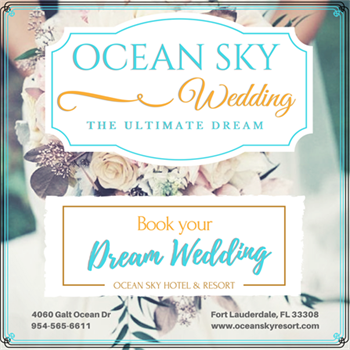 Enjoy all the comforts of home, plus some gorgeous ocean views at Ocean Sky Hotel & Resort in Fort Lauderdale, Florida. We offer 225 well-appointed guest rooms, including 15 oceanfront suites, at rates that fit perfectly in your travel budget. Our refreshed guest rooms feature open-air balconies with new sky blue glass railings and beautiful bedspreads, bed skirts, bed scarves, carpeting, draperies with matching sheers and LCD flat-panel TVs. Choose from rooms with two double beds or one king-sized bed or indulge in our fully equipped oceanfront suites, which include a kitchenette, dining and living room area and a renovated guest bathroom with marble floors. ADA accessible rooms are available for our guests with special needs. This attractive guest room is perfect for two guests, with one king bed and a balcony offering partial ocean and Intracoastal views. If you’re traveling with the family or a small group of friends, choose our Standard Room with two double beds. Ideal for four guests, these rooms offer a balcony with partial ocean and Intracoastal views. Enjoy extra space and amenities in our Deluxe Room, which features one king bed or two double beds, a kitchenette and balcony with partial ocean and Intracoastal views. Treat yourself to our spacious Oceanfront King Bed Suite with a kitchenette and dining area, living area with plenty of seating and a pullout couch and luxurious guest bathroom featuring marble floors. The separate bedroom features a plush king bed where you can rest after exploring Fort Lauderdale. Give your next family vacation an upgrade when you reserve our Oceanfront Suite featuring two double beds. These well-equipped suites offer a living area with pullout couch, full kitchenette and dining area, bathroom with marble floors and separate bedroom with two double beds. Mobility accessible room features two double beds with a roll-in shower or bathtub with grab bars.